My 7 year old son is a keen swimmer and trains 3 times a week (7 – 9 km per week). He has a problem on his crawl whereby when breathing his arm on the opposite side crosses under his body. Can you tell me the best way the fix this ? This question is asked regularly as many swimmers, both young and old, have this problem. 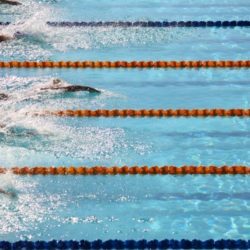 As a swimmer turns to breath on their right hand side, their left hand should be entering the water out in front (and vice-versa). 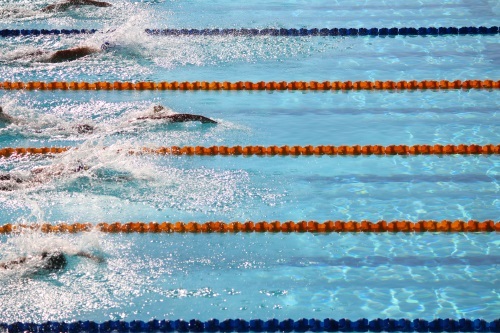 As the left hand pulls through, the head is turned to the side to breathe and some swimmers will cross their hand over midline to gain balance in the water whilst they are breathing. They will also often drop their shoulder and elbow and let their hand go straight towards the midline (and further) at the beginning of the stroke. To correct this, when the front hand enters the water, the swimmer needs to scull (or press) slightly outwards and then scull back in towards the midline whilst maintaining a high elbow position. I will be doing a video on this soon and this will help greatly for your son to understand this better. 4 Responses to How to fix arm going across body in Freestyle? Another suggestion would be to consider this 7 year old’s breathing technique. Cause and effect again. Loss of balance can cause the arm pull to cross the mid-line. But what causes the loss of balance? If it is only happening during breathing there is a great chance that his breathing technique is causing the loss of balance. Questions like “How quickly is he breathing?” “How far is he turning his head?” “How large is the breath intake?” and “Is he exhaling completely underwater?” all need to be considered. I wonder whether a 7 year old swimming up to 3k’s a session, are his efforts focusing on technique or distance. Is he becoming so fatigued in his training that he feels he needs to take too large a breath causing the loss of balance. A simple rule to avoid this would be to stop the swim effort every time his technique falls away. Short repeats more often focusing on technique will build a better and probably fitter swimmer. Thanks Phil for the additional feedback. Howard, Phil makes some good points that would be worth looking into. Especially around the questions of how quickly is he breathing and how far is he turning his head. Thanks for finally talking about > How to fix arm going across body in Freestyle? | The Swimming Expert < Loved it! Thanks for your advice back in March on how to fix my boy’s freestyle arm action. Just thought I’d pass on my thanks and give an update. He’s worked hard on improving his technique over the past 6 months. He’s focused on the breathing and also his hand entry and particularly maintaining a high elbow on the pull phase. . This seemed to help immensely and he’s recently posted a time in the top 20 of the country for this year for his age group.